Finding Earth 2.0 won’t be easy. It’ll be an enormous effort, but the astronomers, planetary scientists, chemists and biologists leading the Carl Sagan Institute have a plan to get us there. Here’s how we’re trying to find the next pale blue dot and an end to our cosmic loneliness. It’s a great time to be alive if you’re interested in worlds beyond our solar system. Over the past two decades, exoplanet science has undergone nothing short of a revolution, and even if you’re skeptical about the idea of alien life, the discoveries we’ve made are damn impressive. Consider the numbers: Twenty years ago, astronomers hadn’t confirmed a single planet outside our solar system. In the past six years, NASA’s Kepler mission—a space-based telescope that orbits our sun, looking at over 100 thousand stars simultaneously—has uncovered over 4100 planetary candidates and 1000 confirmed planets. Kepler is not scanning the whole sky. Rather, the scope monitors a tiny sliver of our galaxy, taking a cosmic census of sorts. With this census, astronomers have used statistics to extrapolate the distribution of planets throughout the Milky Way. Let me repeat that last bit. There may be a billion Earth-sized planets in the habitable zone of a sun-like star. Thirty years ago, astronomers weren’t sure of any. And that, of course, is just within our galaxy. The technology behind this incredible discovery is in principle quite simple. Most exoplanets to date have been detected via transit—a slight dip in the light emitted from a star as a planet crosses its path within the line of sight of a telescope. In practice, however, pinpointing these planetary shadows is insanely hard, because the brief change in starlight caused by a transit event is utterly miniscule. And you need to do so at least twice, to be sure you didn’t just make it up. For transit to work, we’ve had to develop photometers a thousand times more precise than any built before. As Borucki explained, these light sensors must monitor thousands of stars at once, because the chance a planet lines up in the path of a star in a telescope’s line of sight is less than 1 percent. The scope’s photometer also has to remain perfectly still at all times—not anchored to the ground, but in outer space. And for how ambitious those specifications are—it took Borucki nearly two decades to design, prototype, and convince NASA to green-light Kepler—all that transit gives us is a planet’s radius, orbital period, and sometimes its mass. And so far, only for worlds that are at Earth’s orbital distance or inward. (The transit of more distant planets is too faint for Kepler’s photometer to detect.) Through mass and radius we can calculate planetary density, which tells us whether we’re looking at a rocky, Earth-like world or a Jupiter-like ball of gas. So far, the galaxy has been full of surprises. Many stars harbor large worlds orbiting far closer than Mercury, a situation which was considered nigh impossible thirty years ago. The two most common types of planets known to humanity right now—so called “super Earths” and “mini-Neptunes”—are not even represented in our solar system. We have hints of incredibly bizarre places out there, of gas giants as light as styrofoam, of ocean worlds and lava planets. “There’s an incredibly wondrous diversity of worlds out there, and we haven’t even started to scratch the surface,” Kaltenegger said. 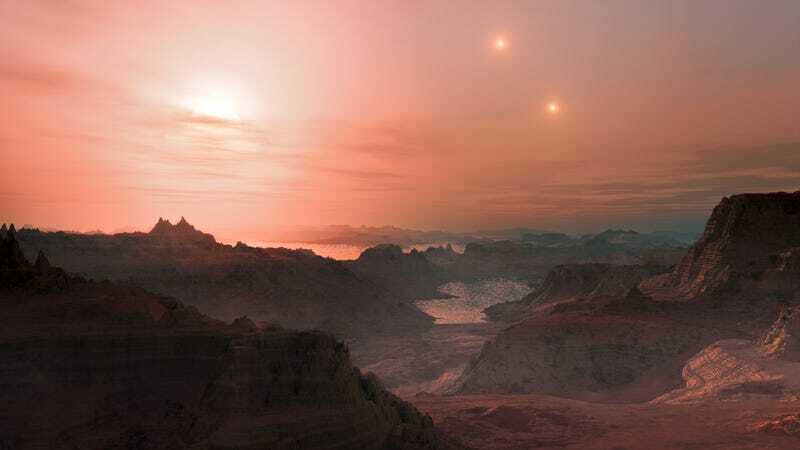 Scattered amongst these exotic worlds, we’ve also found a handful of “Goldilocks” planets—worlds that are not-too-hot and not-too cold, that are rocky, that are orbiting stars like our sun. Worlds that could be the next Earth. “These [potentially habitable] planets are relatively common, and using statistics, we know they’re likely to be nearby,” Batalha said. Still, for a world to go from potentially habitable to a bonafide Earth, we’ll need to get a much better look at it. That’s exactly what we’re hoping to do with the next generation of scopes. With future missions, we’ll look not only look at the ebb and flow of light from distant stars, but at the atmospheres of planets themselves. From light years away, our scopes will effectively sample the air of other worlds. When that happens, astronomers across the world will become alien hunters. Earth may be a cozy blue marble today, but it wasn’t always sunshine and roses. Four billion years ago, our planet’s rocky surface was erupting in fiery volcanoes, bombarded with comets and asteroids, awash in sterilizing UV radiation, and contained practically no oxygen, to boot. It was life that terraformed the Earth—early, hardy colonizers that, over the course of billions of years, turned a rocky wasteland into a comfortable, breathable biosphere. Ancient cyanobacteria were probably the first to produce significant amounts of oxygen as a waste product from photosynthesis. Today, our air contains a healthy supply of O2, replenished constantly by Earth’s plant life and phytoplankton, as well as a thin layer of ozone, which shields us from damaging ultraviolet radiation. Earth’s atmosphere also contains trace amounts of reducing gases —things like CO2 and methane—replenished by the collective exhale of life’s metabolism, and, recently, by the burning of fossil fuels. Taken alone, oxygen or methane don’t make a strong case for life—both can be produced by inorganic chemical reactions. But put them together, sprinkle in a little water, and it’s a different story. So, our alien hunters already have some promising fingerprints in mind. Find these ingredients in the atmosphere of a Goldilocks planet circling sun-like star, and we may just have ourselves another Earth. Now how the hell do we go about searching? Through a pipeline of future space missions, beginning with the Transit Exoplanet Survey Satellite (TESS), which launches in 2017. While most of Kepler’s targets were 500-1,000 light years away, TESS is going to be our friendly neighborhood planet hunter—it’ll scan the entire sky, monitoring more than half a million stars in our very close cosmic vicinity. TESS may turn up many hopeful candidates, but it won’t be studying their atmospheres. That process starts gearing up with the James Webb Space Telescope, a 6.5 meter-long solar-powered observatory slated to launch in 2018. With unprecedented detection power, JWST will become the premier observatory of the next decade. Its sensitivity comes in part from a massive sunshield that chills the scope’s instruments to below -370 degrees Fahrenheit. At such low temperatures, the JWST itself emits very little radiation, allowing for the detection of faint energy signatures from far away—including slight dips in the light emitted from a distant star as it filters through a planet’s atmosphere. But. Impressive as JWST will be, this scope still won’t be powerful enough to study many rocky, Earth-like planets. (If, Kaltenegger says, we find a rocky super-Earth around a dim red dwarf very close by, we may have a chance of looking at its atmosphere.) JWST’s eyes will be fixed on mostly larger worlds—and these will typically be blustery blobs of gas. “JWST is going to knock it out of the ballpark for mini-Neptunes and super Earths, it’s going to understand the diversity of their atmospheres, but its not tailored to find Earth-sized planets,” Batalha said. Next up after JWST is the Wide Field Infrared Survey Telescope (WFIRST), a retrofitted spy scope that, using a technique called microlensing, will have the sensitivity to detect smaller than Earth-sized planets orbiting at distances beyond 1 AU (the distance between Earth and the Sun). Using a starlight-blocking coronagraph, WFIRST will also be able to directly see reflected light from some larger planets. And once WFIRST launches in the mid-2020’s, space agencies finally plan to double down on a “life finder” mission. It’s this future mission which we’re hoping has the power to decode the atmospheres of many rocky, Earth-sized planets orbiting stars throughout our stellar neighborhood. Three decades till we’ve got a good chance of finding the next Earth seems to be the ballpark most exoplanet hunters are comfortable with. But if Earths turn out to be very common, we may get lucky and find ourselves a neighbor sooner. It may take several decades for the technology needed to spot Earth 2.0 to come online. But astronomers aren’t just twiddling their thumbs waiting. At the Carl Sagan Institute, Kaltenegger and her colleagues are amassing troves of information that will help alien hunters hone in on the most promising candidate worlds. These include a fingerprint database containing hundreds of hypothetical atmospheric chemistries—some that look like our Earth today, some that look like Earth’s geologic past, others which are totally alien. The database, which Kaltenegger once described to me as “CSI for exoplanets” will be used to categorize distant worlds and rank them in terms of how Earth-like they are. A color catalog will help us search for an entirely different type of fingerprint. Just as Earth’s green landscapes and blue oceans hint at life’s presence, the vibrant biota on distant worlds might offer telltale clues. In a study published in March, researchers examined over 100 microorganisms across planet Earth, including many that live in extreme environs, and documented their reflection signatures. The diversity of colors represented in these critters will help alien hunters imagine what life might look like and how we might detect it beyond the pale blue dot. “If a world had a different biota than what is dominant here, it would look different,” Kaltenegger said. “If you think about this in colors—how does a world look in the blue, red and green—the different surfaces would appear different colors. And that’s what you could use to prioritize which planets look more like they could host life. Once We Find It, Then What? It’s incredible to consider the possibility of finding a second Earth. But even definitive proof of life on another world won’t eliminate our desire to explore. Quite the opposite. Which brings me to a question posed at the very end of the Carl Sagan Institute inaugural ceremony, to a panel full of astronomers, astrobiologists and planet hunters. Say we find another Earth. Say it’s close—a couple light years or so from our solar system. Then what? The resounding response was exactly what any science fiction fan would have hoped to hear. We have try to get there. “If somebody finds a real Earth-like planet within a few light years, my reaction is, lets start building a spacecraft,” said Cornell astronomer Steve Squyres, the lead investigator on the Mars Exploration Rover. A manned interstellar voyage would almost certainly be a multigenerational trip. In a world that seems increasingly obsessed with instant gratification, it can be hard to imagine people sacrificing their lives for a journey they’d never see the end of. And yet, as Ann Druyan, co-writer and producer of Cosmos pointed out, everyone involved with exoplanet discovery today is a multigenerational thinker.